Yesterday was Miss Baseball’s one-year anniversary. For those of you who don’t know me, I am a mom with two wonderful boys who live with autism. When you live with someone with autism, it is very easy to lose yourself, and I did. I was so busy being a mom, nurse, occupational therapist, speech therapist and special needs teacher to my boys, I forgot about me. I am not ashamed to say I became very depressed. I even went to therapy. I found a great therapist who didn’t use a pad to solve the problems but a simple question. What do you like to do? Stop being everything to everyone else and start being something for you. I rediscovered my passion for writing, and then baseball came back into my life. Then I combined my two loves, writing and baseball, and Miss Baseball was born. What a wild ride this has been. I went from not knowing how Twitter works to having almost 800 followers. My Facebook page has some of my most wonderful followers. Thank you to all my fans. Your support means a great deal to me. I would also like to thank all my baseball players who have been supportive of me. When I hurt my knee, Derek Holland gave me some wonderful words of encouragement. //platform.twitter.com/widgets.jsEncouragement and positivity are important in recovery. Having Derek Holland’s words really made all the long hours of physical therapy worth it. I am all better and very grateful for the kind words. 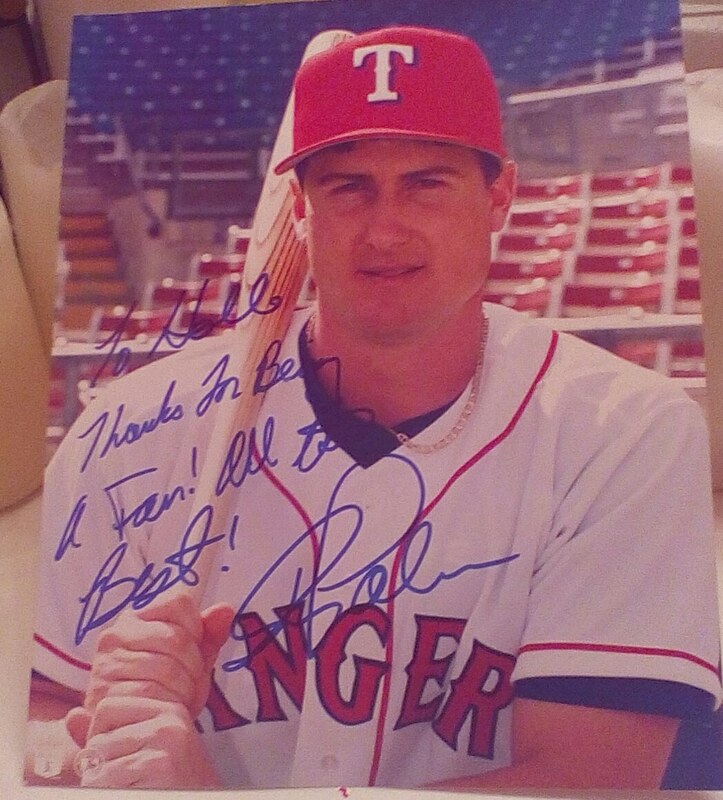 Thank you again Dean Palmer for my autographed photo. When I wrote about Dean Palmer, I never thought in a million years he would respond. And I am amazed that he did. @hollieham0 it would be my pleasure to sign it for you. On a more serious note, being a special needs parent, I am very particular to the charities that I support. While I don’t have any children with vascular birthmark, it frightens me to think that there is a child with one of these and it is either misdiagnosed or, worse, wrong advice is given. Please go to the Frank Catalanotto Foundation. Learn about this condition and all the good work that the foundation does. Also, to Frank Catalanotto, thank you for all the retweets of my articles. I wouldn’t be here without your support. 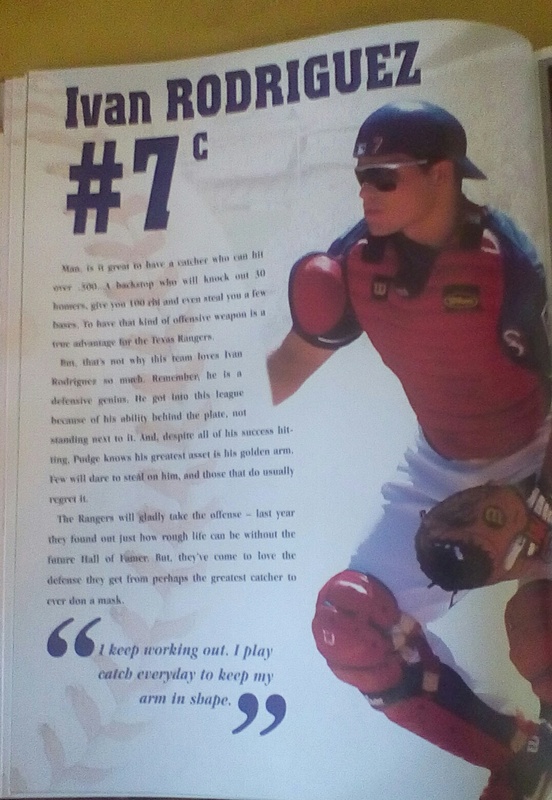 Last but certainly not least: Frank’s Ranger teammate Gabe Kapler, whose blog on KapLifestyle inspired me to write. I am very honored to be a part of the KapLifestyle family, and I would like to thank my “brothers” Matt Fields and Matt Paré. I’ve got to do a quick shout-out to Cleat Geeks. Thank you for letting me be a part of your website. I really enjoy writing for you. There are also some great people behind the scenes. I would like to thank Peter Summerville and Stephanie St. Amour. Thank you Stephanie for all the MANY times you have helped me on my blog. Finally to Duncan Gilman, my friend since the seventh grade. He’s also my social media guru. He tells me do this and do that, and it would help my blog. I would do this and that, and each day my blog got more traffic, and I got more followers. He has celebrated every triumph and consoled every failure. There would not be Miss Baseball without Duncan. Thank you is not enough, but I am at a loss for words on my gratitude for all that you do for me. Today, I thought I would end with my favorite article. It’s something that I truly believe: Baseball is life. No matter where you go or what you do, baseball is always there. I once read a Twitter post that said, “Baseball is not life, it is something you do. Life is something you live.” A former ballplayer wrote that, and I can understand it. But I disagree with it. Baseball IS life. I am back from a much-needed vacation. I toured the city of Corpus Christi while avoiding Tropical Storm Bill. While my intention to go to a single game was washed out, I was treated to a double header the next day. The USS Lexington is close by, and I took my boys to view the massive museum. We toured the ship, and when my youngest was too tired to go on, we headed over to the mess deck to get a drink. 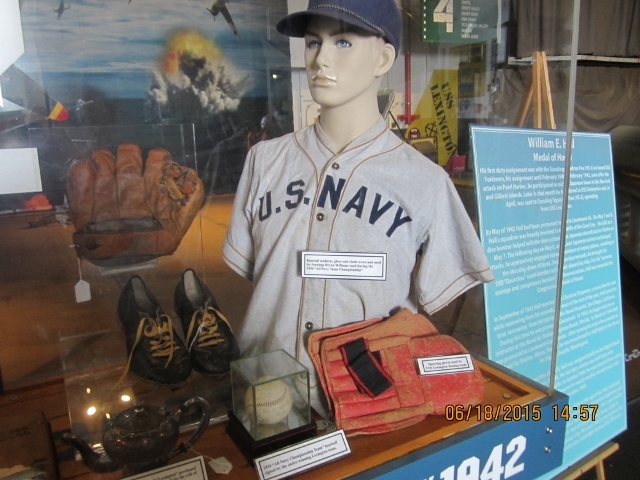 We passed by this case full of baseball artifacts from 1933 and ’34 Navy baseball teams. The vision of sailors, playing baseball — I think about them on the flight deck, with gloves on, tossing a ball around. I have a vision of the stands in the ballpark and sailors watching and cheering the other sailors playing. 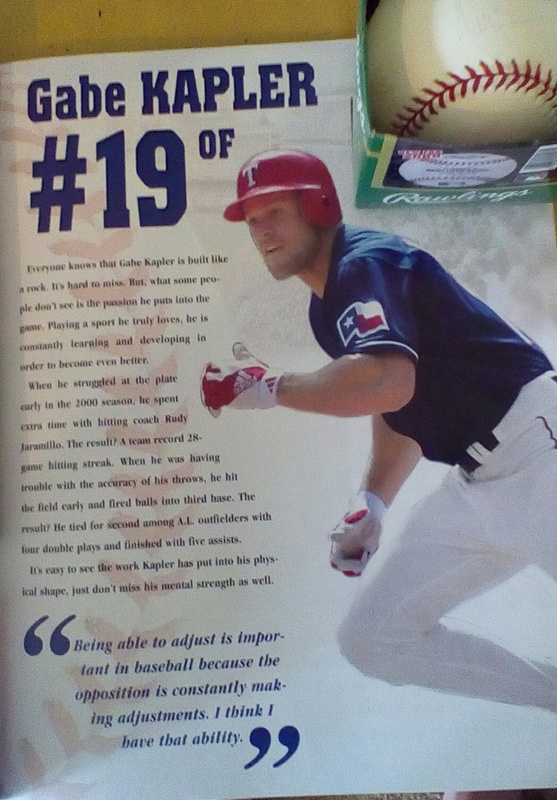 I think a little bit about the Twitter quote as I walk over to Whataburger Field. The Frisco RoughRiders and the Corpus Christi Hooks are Double A-ing my fun with a double header. I get the last ticket behind home plate. 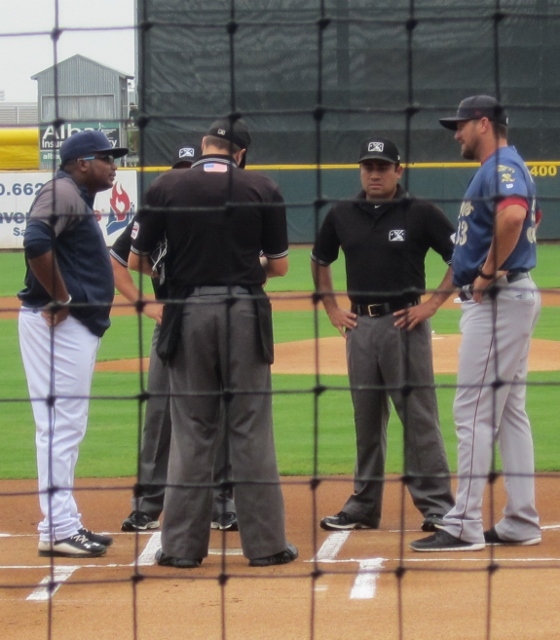 Hooks Manager Rodney Linares and RoughRiders Acting Manager Jason Hart exchange lineups. I am in my seat ready to watch some baseball, when my seat neighbor appears, a nice woman with her mom and a family friend. That’s right, I am sitting behind home plate and it is girls’ night out. My neighbor is a huge Hooks fan, and the teasing commenced as I cheered for the RoughRiders. She and I talk about baseball throughout the game. She had her favorite players, ones she liked because they were kind to her child and others that were kind to the eyes. Yes, I was giggling like a schoolgirl over some cute ballplayers; not going to apologize for that. Baseball pants are the world’s greatest invention. Two games, 7 innings each, and the RoughRiders lost both, but there was some good ball in there, and I see a great team. I even have a favorite RoughRider. His name is Drew Robinson, and he wears 16 (Dean Palmer’s Ranger number) and he has a passion for the game. The game is over, and I find the Frisco team bus. And while I couldn’t wait for the players to come out, I did meet more people. I met the founders of Keeper of the Game Foundation, and the business card read, “Serving kids with special needs and disabilities while promoting servant leadership.” As a mom of two children with autism, I am in awe. I am then handed a photo of my favorite player, Drew Robinson, and I hang it here near my desk. After saying my goodbyes and getting in the car to head back to my hotel, I am just as relaxed after a double header as I was playing in the ocean. Baseball is life — it keeps popping in my mind. Seeing baseball artifacts on the USS Lexington, going to a double header and being with other women who love baseball as much as I do, meeting people who understand how important baseball could be to special needs children. It just made me think, this is life. Baseball is life. Baseball connects us. It moves us, it bonds us into a community. Baseball has all the markers of life: passion, love, hatred, obsession, lust. Baseball is the perfect euphemism for life. You may strike out more than you hit a home run, but you never stop swinging. The July 31 trade deadline is ever looming. ESPN put out a story about the Most Lopsided Trades. This made me think of some crazy, lopsided Ranger trades. I once heard George W. Bush talk about how he did regretted trading Sammy Sosa, but at the time, Sammy was 20 years old and not really doing anything. Who knew what would become of him? The bigger regret is who also left when we traded him to the Chicago White Sox. Wilson Alvarez: In the past, the Texas Rangers have not been known for great pitching. In 1989, there was a trade for Sammy Sosa, Wilson Alvarez and Scott Fletcher. The Rangers got Harold Baines and Fred Manrique. As a longtime Ranger fan, I am still crying over this trade. Alvarez went on to be an All-Star pitcher, with a 14 year-career and an overall 3.96 ERA and a 1.390 WHIP. I know the Rangers sure could have used him. In the ESPN Lopsided article, they talk about the Mark Teixeira trade, and the Rangers really benefited on that one. July 31, 2007: Traded by the Texas Rangers with Ron Mahay to the Atlanta Braves for Beau Jones (minors), Elvis Andrus, Neftali Feliz, Matt Harrison and Jarrod Saltalamacchia. There was a trade in which I almost feel sorry for Detroit. Juan Gonzalez was traded in a nine-player deal. 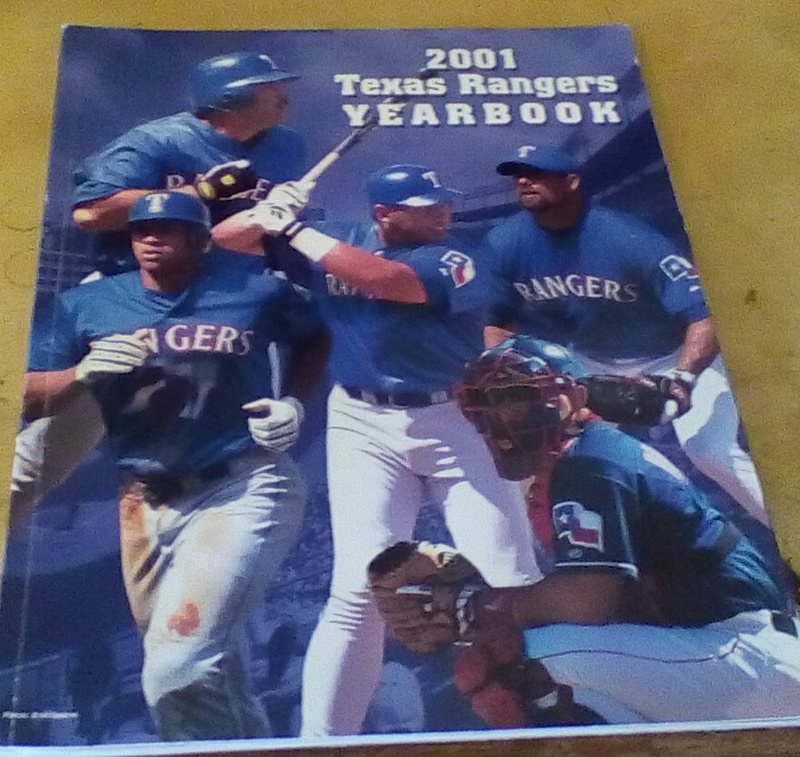 The Rangers traded Gonzalez, with Danny Patterson and Gregg Zaun, to the Detroit Tigers for Alan Webb (minors), Frank Catalanotto, Francisco Cordero, Bill Haselman, Gabe Kapler and Justin Thompson. Alan Webb and Justin Thompson: While these turned out to be duds, the rest of the deal worked out great for the Rangers. 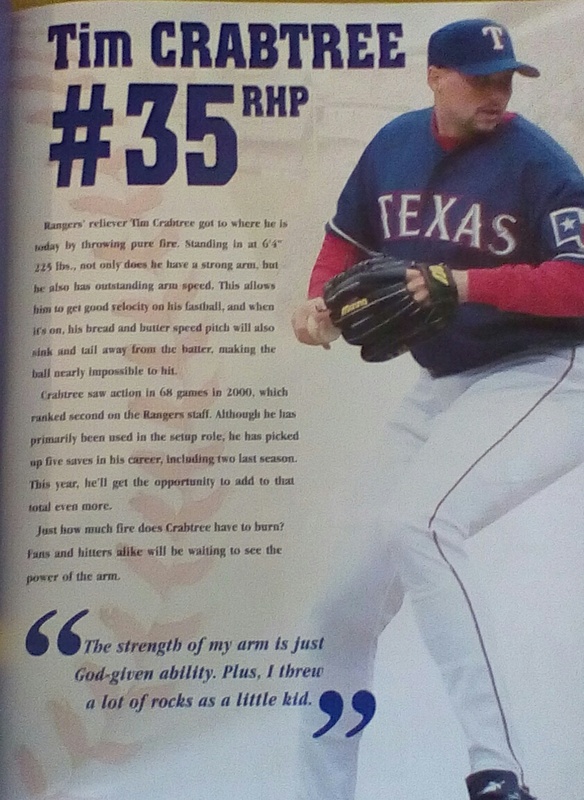 Francisco Cordero went on to be an All-Star closer for the Rangers. In 2004, he had 49 saves, an ERA of 2.13 and WHIP of 1.284. 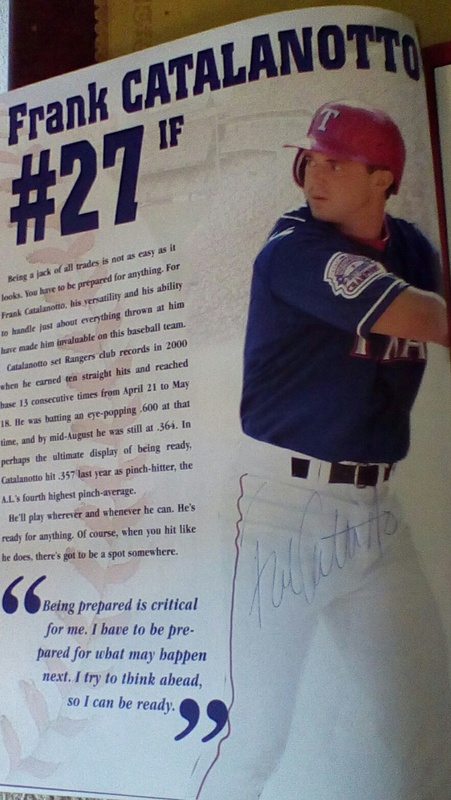 He played for the Rangers from 2000 to 2005. Gabe Kapler, a good outfielder and good numbers, with a BA of .280. He was a fan favorite, especially with my girlfriends. Trades are a part of the game. There are some who underperform, or a trade was just what they needed to get their game on. You truly never know how a player is going to be until they are in uniform on the field. What’s a crazy trade you remember? Drop me a line, and let’s keep the conversation going. Texas Rangers: When I think of Ranger baseball who comes to mind. Now I don’t know if the team made the list or if MLB made the list but my first three choices were no brainers. Micheal Young, Ivan Rodriguez, Nolan Ryan and my write in because I don’t know how you can talk about Ranger baseball and not mention him. RUSTY GREER! Giants: Christy Mathewson,Willie Mays,Buster Posey, and I don’t know how you can talk about the Giants and not mention Will Clark so he is my last write in vote. Ok so that’s the list, Who would you pick? well I decided to clean out all my clutter which was surprisingly easy and mostly paper. I dug around my closet and found this box, and it was full of my baseball stuff. It was like a time capsule of all the baseball stuff I had collected. 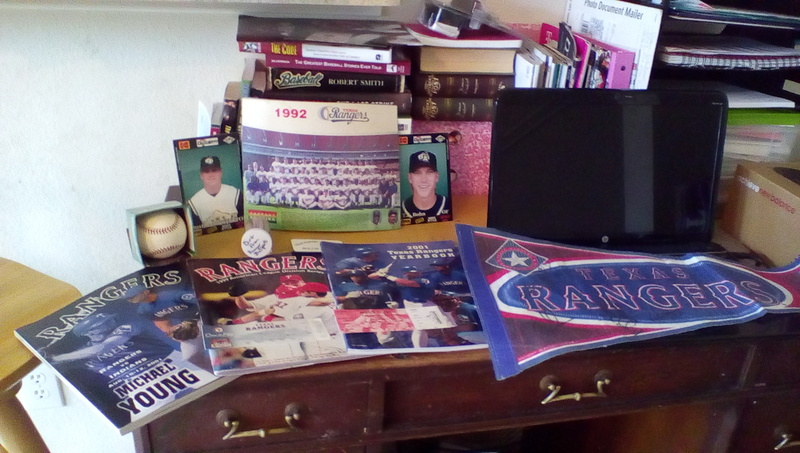 Thanks Gabe Kapler, if I hadn’t uncluttered I would have never found all these wonderful things. What a wonderful discovery to find another signed item of Frank Catalanotto. I didn’t remember either my signed Kapler ball, I don’t know if it can been seen on film but its there just really faded and even though it wasn’t exposed to light it still fades away. so tip use a Sharpie. Today was like finding money, it was wonderful to remember when I got the book and when I saw these guys play ball. TBT: on the field at the ballpark in Arlington. Happy me on the field right before the game. 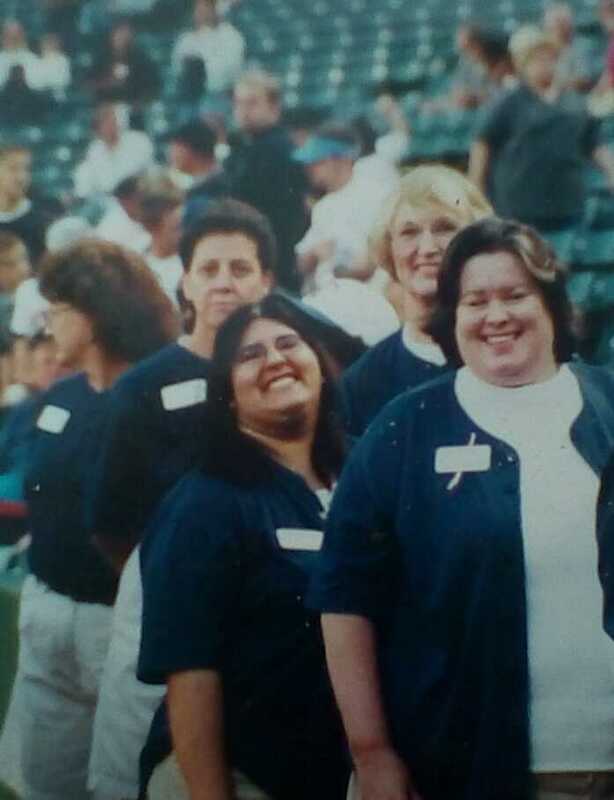 This was in September 2001, and I’m volunteering with the Texas Rangers Women’s Club. A wonderful organization that uses its fund to bring kids to Rangers games. The Rangers honored us by allowing us to line up right by the dugout as the Ranger players took the field. I know what you are thinking because I thought the same thing too. I had visions of the guys giving me high fives as they took the field. What actually happened was another story. Now everyone in baseball knows Frank Catalanotto and Gabe Kapler. Nice guys, signs stuff for fans. You get the picture. Now as a fan, we see it from a far, never up close. The GAME FACE. I was not prepared. I had only seen these guys off the field. As we lined up they changed, the intensity came over them as the announcer drew out “your Texas Rangers!!! !” And the image I could use is a wolf. Strong, Beautiful, Intense, Deadly. Gone was the nice Frank Catalanotto instead he ran quickly to his position with an intense brooding that was frightening. Gabe Kapler, whose massive physique only intensified his wolf persona. As he ran by I wanted to throw a steak at him and run the opposite direction. As they took the field the ground rumbled, and I had this fear that the wolves would attack but they just ran by and I had a sense of relief as we were escorted off the field. To witness first hand the drive, the determination, the focus. It made me proud that these guys still had their fire. That being said I would never want to be on the field at game time ever again. When it’s game time I will be in the stands away from the wolves. The other day I was on Twitter and the Blue Jays did a retweet. I thought “Hey! its Frank, I could write a whole other post about the Frank Catalanotto Fnd, but when I started following it, I then saw Frank’s official Twitter account. and started following that too. I was very excited to find Frank, as he is one of my favorite former Rangers and all around nice guy. so I just put out there. I'm in baseball fan heaven, I follow @Pudge_Rodriguez @gabekapler @fcat27 all I need is Rusty Greer. Love my @Rangers! Do you know who favorited it? Pudge and Frank! This makes me so happy and gets me excited to work more on this blog, so in the coming months I am going to dare to ask for interviews and I am going to be more vocal on my opinions on baseball. Be patient with me as I am still recovering from knee surgery. The best is yet to come.